KITsubs: Kamen Rider Skyrider Episode 23! That screenshot says it all. What a way to celebrate coming back from vacation than with a double serving of Rider Kicking? All things said, this isn't as momentous an occasion as Stronger's appearance a few episodes ago, but we're starting to establish a status quo for the Riders here. Also, we have yet another episode of Japanese media with a plot involving "Human Bombs." I always find this particular trope to be kind of gruesome for a children's show. All "shows for babies" jokes aside, it's a pretty harsh concept to wrap your head around! Thanks for being so patient with us, everyone. Between the holidays, personal obligations, and "real life," things really got out of hand. 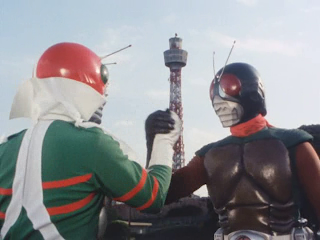 But we're back now, and we're happy to bring you more classic Kamen Rider episodes! Be sure to come back next week for Kamen Rider 24. And thanks for watching! Good to have you guys back, I was beginning to worry. Thanks for the hard work. i can't choose any download link.. it says 404.. can you please help?